Car paint protection. Tulsa keep your car looking new with paint protection film. Call Alta Mere window tinting Tulsa. Same Tulsa location since 1994! Sometimes, the most important aspect of driving on the road is what's ahead of you. Visibility is crucial, no matter the time of day or the conditions outside. That's why your headlights are such a necessary feature for keeping you safe in the car. They shine a light on everything, even during the daytime. This allows you to make quick decisions that can prevent accidents and injury. The experts at Alta Mere Automotive Outfitters can provide daytime runnign lights, as well as repair the damage they get from wear and tear. One of the must-have safety features that Alta Mere recommends is daytime running lights. These headlights run all the time, which gives you additional visibility. According to Ron Frydrychowski, chief operating officer of the Moran Family of Brands, these lights are so important that they're a standard feature on every new car. "They started back when motorcycles first came out," Frydrychowski said. "You started seeing motorcycles that kept the headlights on so that people can see them. The same thing happened with cars." Daytime running lights function a little differently than your standard headlights. Instead of having to turn them on like your low beams, they activate automatically when you turn on the ignition. Unlike your fog lights, which are additional lamps located on the front bumper, these lights are part of your regular headlamps and function at a lower intensity than your low beams. The main benefit of this is that you can be seen on the road during the daytime. The light will help drivers know where the car is on the road, and make quick decisions if someone is driving erratically. That can prevent accidents and save lives. 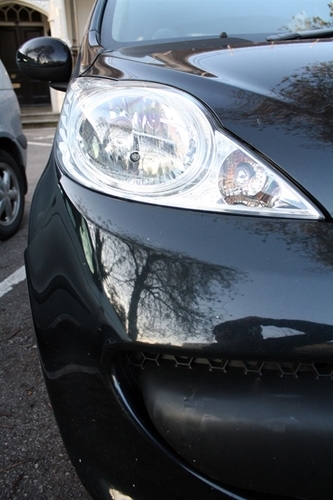 Of course, over time, headlight use can cause wear and tear. You'll probably notice this visually over time: The lamps look cloudy, and your lights change from white to yellow. The light itself hasn't changed, but the lens covering it has. "The plastic lens of the headlight needs a protective coating," Frydrychowski said. "That's a chemical they put on at the factory. And that chemical tends to oxidize from the light and the heat coming from the headlamp itself." As a result, the lights lose their intensity, change color and become distorted. This reduces your visibility on the road and your appearance to others at night time, which can cause collisions. The wear and tear is a result of several different factors specific to the headlamp, on top of debris and UV rays damaging the coating. "The rest of the car doesn't get that same kind of punishment with the bright light coming through from the headlamp and the heat," Frydrychowski said. "With the coating, it's just put on plastic." While it's possible to replace the headlight entirely, that can be a very expensive process. Headlamps can cost hundreds of dollars each, which means they should only really be replaced if yours are actually broken. A foggy lens could be restored without having to replace the entire assembly, which makes it another safety must-have at Alta Mere. The coating gets replaced, and you have a like-new headlamp once again. "Basically, we sand [the old coating] off and reapply a new coating," Frydrychowski said. "Then we either bake it or heat it through a heat lamp." With newly restored headlights, you get the benefits of replacing them without the heavy price tag. Your car will look great and you'll be able to see better on the road at night.